Replacement Memory Foam Ear Seals for LightSPEED Zulu, Zulu.2, Zulu 3, Zulu PFX, Sierra, and Tango Headsets. Lightspeed Part Numbers A482 / A490. Second pair bought in two months. Review: Fit perfectly and the best price I could find. Review: It met my expectations. Fast delivery service. No complaints. Review: Arrived in good condition and quickly from date of placing my order. Review: Just what I expected. Q: I need seals and mic cover for my Lightspeed twenty 3G headset. Do you carry those? A: You bet! 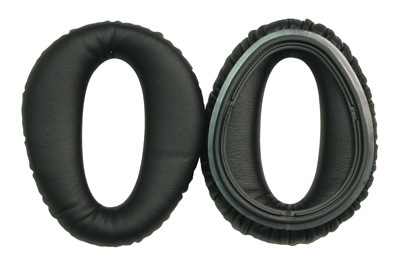 We have the LightSPEED 3G Ear Seals and the Mic Cover for LightSPEED Headsets. A: Replacing the ear seals on the Lightspeed Zulu and Sierra Headsets is super easy, but sometimes it is scary to just pull on them without knowing what will happen. So, we've created a short video for you to see how to replace the ear seals. Just gently pull on the sides of the old ear seal at a couple of places and it will pop right out. Line up the groves and press down on the sides to re-insert. Watch the quick video below to see it happen! A: These are made by LightSPEED and the exact same as the ones that you received with the Zulu headset when new.